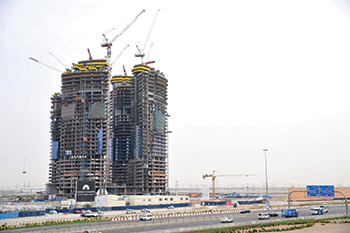 The $1-billion Damac Towers by Paramount resort in the Burj area of Dubai continues to make good progress, and as of last month (March), the core walls for each tower had reached Level 23 above the podium levels on all four towers with the slabs having reached the 19th level, according to the developer. The show home for both the hotel rooms and the serviced hotel apartments is being finalised on-site. On completion next year, each tower of Damac Towers by Paramount will stretch more than 250 m into the air, with 10 podium levels and 58 additional storeys, offering stunning, panoramic views of the Burj area. The project includes an 800-key Paramount Hotels and Resorts Hotel, which will bring to life the Hollywood glamour and California Cool of the past century of Paramount Pictures. The project also includes more than 1,000 luxury serviced hotel apartments which will be managed by Damac Maison – one of the largest operators of serviced living in the region. 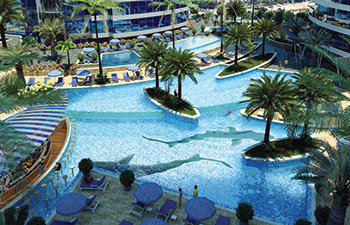 An artist’s impression of the swimming pool. Each luxury serviced residence provides stunning views and is managed by Damac Maison, providing high-end concierge services, in-room facilities, luxurious spa, kids club, fully-fitted kitchens and a unique rental pool scheme. The four towers meet at a multi-level plaza, offering food and beverage concepts, meeting and events facilities, screening room, wellness and fitness centres, expansive swimming pools, kids club and retail merchandise, all featuring the Paramount Hotels & Resorts brand. Damac Towers by Paramount is currently one of the single largest projects under construction in Dubai. The total number of floors will exceed that of the Burj Khalifa, the world’s tallest tower, when it is completed in 2016. Such has been the response to the project that Damac has already announced plans to build another Paramount Hotels and Resorts project in Dubai. Paramount Hotel Dubai, Downtown will include 1,250 rooms and suites, making it one of the biggest hotels in the emirate.